Lynn and I are not that technically oriented, however, occasionally something comes our way that causes us to re-think such things; so it is with the K-J (Kendall Jackson) recommends App. This App allows the user to pair Kendall Jackson's variety of wines with any food, occasion, time of day and even mood (happy, playful, reflective and so on). This helps both take the guess work out of these scenarios as well as helps educate not only the wine lover's palate but also helps educate particularly about the notions of the connection between wines and mood which is often overlooked. The App is compatible with the iPhone, iPad and iPod touch and can be used with most major social media including Facebook. The App is free of charge and is available at http://bit.ly/W42iJu for Apple devices and http://bit.ly/SWMv0W for Android devices. 2012 has not been a happy one for food lover's in Brookhaven, NY. First, the venerable Wallen Market in Bellport closes, then, last spring Painter's has a fire which does apparently just enough damage to keep it from re-opening quickly and now it appears to be for sale. So, we were understandably hopeful that the Hamlet Organic Garden's (HOG) Feast of Field and Forest would deliver a positive and festive experience for the community sorely in need of one. Well, as they say, Mission Accomplished. The food, generated and prepared by the Lost and Found Pop Up Culinary operation was an embarrassment of riches with a host of locally sourced ingredients/food/drink. Our favorites? Honestly, pretty much everything, particularly the locally caught trout, the tofu with birch bar bq sauce and the wines by Anthony Nappa which come from nearby Peconic. Michael Popek's day job as a dealer in a family run antique bookstore took an interesting turn when he began to take note of the many interesting ephemera tucked into the pages of some of the antiquarian and used books in his store. Mr. Popek began collecting these items with specail attention to the recipes he found within the pages; recipes for a variety of culinary fare such as Pineapple Date Bread, Meat and Cheese Loaf, Almond Christmas Balls and something called Chocolate Porcupine. 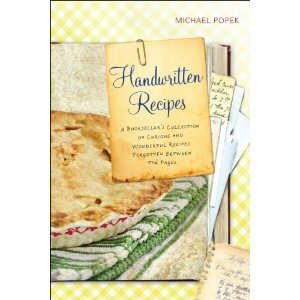 Mr. Popek has worked hard to curate and display his recipe collection on HandwrittenRecipes.com. His interest has led to the recent publication of Handwritten Recipes: A Bookseller's Collection of Curious and Wonderful Recipes Forgotten Between the Pages (Penguin). Mr. Popek was nice enough to correspond with Mark and Lynn about his work and his interest in recipes as found objects. M & L: Is there something special about finding a recipe in a book that sets it apart from finding say a picture? MP: "Absolutely. Photos and old letters are fine for speculation, but recipes give us a chance to bring that moment back into the present. I can run to the grocery store for supplies and give it a go, make changes, scribble down notes - I can take the ephemeral out of the ephemera and make it my own. Oh, and it's tough to serve a photograph to hungry guests." M & L: What do you think was the most memorable recipe(s) that you found in one of your books? MP: "I always get a kick out of the home remedy recipes I find, like this one:"
"Nothing like linseed oil to take care of that cough." M & L: Do you see differences in the kinds of recipes you see in books depending on what decade/era they are from? MP: "Most of the recipes I find are from the 1930s-1960s, and I've noticed that there are lots of casserole recipes. I'm sure if I had a broader collection to inspect, I'd find that the number of casseroles would drop significantly in the 80s and 90s, but I think the general eating public are returning to simple goodness of one dish recipes. " "I've also noticed that most of the older dessert recipes were cakes or pies. In the newer desserts, I found a lot more muffins, cookies, cupcakes... hard to believe, but based on the small sample size, it seems that the servings were getting smaller." M & L: Did you ever try to create one of the recipes on your own? Do you hear from people who use the recipes that you have salvaged? "I tried a few dessert recipes without much luck. Baking has never been my strong point, I'm more of an entrée man. The waffle recipe I tested for the book came out fairly well, but I think it works best with an old-fashioned waffle iron that can really get hot." "I've been lucky enough to have a bunch of readers try out recipes on the blog; there have been hits and misses. The blueberry muffin recipe turned out to be a dud." (http://www.handwrittenrecipes.com/2009/11/blueberry-muffins.html) but the pasta with artichokes was a big success (http://www.handwrittenrecipes.com/2011/08/pasta-with-artichokes-tale-of-2.html). In 2009 NY Times bestselling author Eloisa James took a chance that many people merely fantasize about: she sold her house, took a break from her job as a Professor of Shakespeare, and summarily moved her family to Paris. 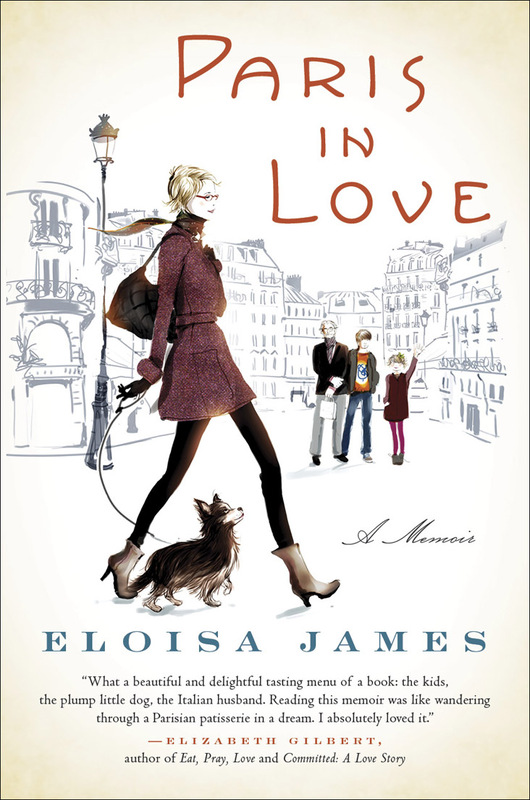 Paris in Love: A Memoir chronicles her sweet, funny and eventful year soaking in the fashions, art, atmosphere and of course food and drink (with her Italian husband and entertaining young children in tow) in a city well known for it's romantic quality. Ms. James was nice enough to correspond with Mark and Lynn about her work, French food and what it takes to be a good romance novelist. M & L: How did living in Paris change your palate and the way you eat? EJ: "I don’t think it changed my palate. But it made me wistful for a life I don’t have here in the U.S., where I am overworked: a life in which one spends two hours lingering over an excellent lunch, followed by a peaceful nap (not a cat nap), and then caps the day with a lingering meal with people one loves, none of whom are teenagers. Perhaps in my next life!" M & L: Did all of the great food and wine make you jaded or cause you to take this aspect of your life in Paris for granted? EJ: "It made me envious. Although, as I point out in Paris in Love, there is an extraordinary amount of bad food served in Parisian restaurants. One has to be careful not to idolize the French too much: they happily eat at restaurants that could not survive in New York City, in my estimation." M & L: What would you say your favorite food/meal was while in Paris? Your least favorite? EJ: "I grew to treasure the way the French make hot chocolate, with one small pitcher of steaming milk, and another of excellent chocolate, so rich and dark that it slides into the milk like a helping of mud. Mixed together—in just the proportions that you love—it is truly a drink for the gods." "My least favorite meal took place, unfortunately, at a Michelin starred restaurant. I ordered tête de veau, or calf's head, and that was a mistake." M &L : Was it hard to stay in shape in Paris with all of the great, rich food or did you manage to keep yourself fit? EJ: "In a word: Yes!" 5. What do you believe are the key differences between a good romance novelist and a bad or mediocre one? The best romances have a rhythm and a promise that works. I know the world is a tough and cold place; I’ve lost my mother and I have a child with a chronic illness. But—and this is a big but—I also know that love and joy make all the difference. A great romance reminds the reader that if there’s a pattern to the universe, it’s one shaped around and by love. We can all use that reminder now and then. Lynn and I and family made our way through the West Village and ended our eventful day at Fish which is, as you might imagine, is a New England style seafood restaurant with low ceilings, nautical and fishing ephemera and a raffish vibe. The night we were there we found a rowdy, but mostly friendly Labor Day crowd (oddly, the couple sitting next to us seemed uptight and humorless for some reason, oh well). We have had a lot of luck with finding good seafood in restaurants and markets but the seafood here was really particularly amazing and some of the best we have had outside of Boston and, Fish was the rare seafood restaurant that we had experiences with a comfort food vibe. I have rarely seen grilled calamari on menus on Long Island (or elsewhere for that matter) so it was a great treat to have a very flavorful yet simply prepared version here (too many restaurants weigh calamari down with overpowering sauce). Lynn had a colorful, flavorful serving of "angels on horseback" which Lynn appreciated as a nostalgic "Mad Men" era appetizer from the cocktail parties of her parents when she was a youth. We hit Fish on a Saturday night so it was rocking and rolling. We imagined that it might be pleasant to go during the week when the pace was not so breakneck as the staff was very accommodating and the bar was welcoming. We were greatly impressed. Our bartender, Zach, was very cool with his impossibly crisp pink shirt and made me the best Manhattan I think I have had on Long Island (maybe the best anywhere). Lynn had a stress reducing drink called a Tangerine Blossom whose main ingredient is Mandrian Blossom Vodka. As for the food, we managed to have a couple of things that I had always been interested in trying; a grilled romaine salad and grilled oysters. 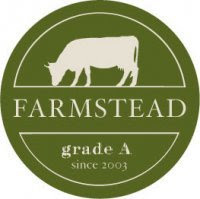 Lynn and I salved our disappointment of Farmstead by treating ourselves to an excellent fast food experience at, of all places, on Route 95 in Connecticut at a rest stop near Milford, Good to Go Organics. Lynn treated herself to two great veggie/soy dogs served on a nice piece of whole wheat flat bread. I had a great salad with organic arugala and baked chicken tenders. 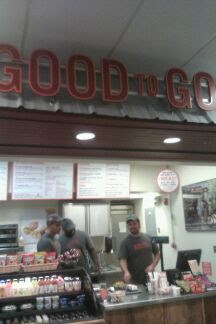 Really nice service as well; healthy, civilized food at rest stops? Hope this is a trend and not just an anomaly. Lynn and I had heard about the Farmstead Cheese Shop and La Laiterie Bistro adjoining it for for many years and were excited to try it as the website communicated that this place was innovative in its menu and approach to artisan cheese making and hand crafted food Farmstead/La Laiterie had also won praise from the likes of Travel + Leisure, Bon Apetit & Food And Wine. Very recently on our way to Boston we made a special point of going through Providence to get lunch at La Laiterie and maybe get something from Farmstead. Lunch is served there until 3:00 and we got there later than we would have liked at 2:30. There were still plenty of diners there and there was little sense of the place winding down as there were still waiters wandering around and a hostess present and, again, a restaurant that was mostly full. Things went badly rather quickly. The hostess saw us waiting to be seated and then disappeared. I had a bad feeling about it as she clearly saw us but made minimal eye contact. The Cheese shop personnel could also see us but they made minimal eye contact as well and eventually turned their literal backs on us. A woman entered from the back of La Laiterie and made a sympathetic face towards us and mentioned that someone would be with us in a minute. Roughly five minutes had passed at this point and Lynn being curious about the place went over to the Cheese counter and began asking questions. At that point, the Cheese counter personnel had a harder time ignoring us but Lynn later mentioned their communication was disconnected (one of the staff gave her a brusque "no" when she asked if they sold one of their hand made sauces). Lynn also said how excited we were to be there and how we had read about both Farmstead and La Laiterie and had made a special trip to try the place out. Their response? Nothing. Two of the place's chefs walked by our table; a beefy guy and a tall woman and still no eye contact, much less a hello. Finally, after about 10 minutes time the hostess found it in herself to seat us. Our waiter showed up while Lynn went to the restroom (whose lock was broken). I ordered two glasses of Rose but foolishly did not order our lunch (or maybe wisely). Our waiter seemed slightly more with it than the rest of the staff so I was hoping that our experience, so sour up to that point, might be salvaged. How wrong I was! After at least 20 minutes total in the restaurant we did not even have our wine. Lynn and I both looked at each other with our "we are out of here" faces and summarily bolted out the Farmstead door. Our waiter was standing outside on the restaurant's sidewalk apparently having forgotten about us, chatting with a passerby as our $12.00 a glass wine was warming up in the August heat. We got into our car parked just outside the place. I don't like writing bad reviews. Lynn and I love food, wine, spirits; all of it and we like our experiences to be positive which they almost always are. When we are disappointed it is usually because something doesn't live up to the hype or we have shoddy service. With this place it is check and check; definitely not up to the hype and memorably bad service. Lynn and I were both completely blown away by the complete rudeness. obnoxiousness and obliviousness of the place. It seemed pretty much top down (maybe with the exception of the woman who alerted the hostess, the hostess who had first ignored us). The experience was doubly bitter because we had pondered going there since January when we had last been to Boston and, we were starving so, again, we felt even more defeated than usual. In any event, lesson learned here. You have been warned! Lynn and I found ourselves somewhat exhausted with our usual dining choices. So, we went against our own grain and parked ourselves at the very rowdy but somehow very charming restaurant on the Great South Bay of Long Island in West Sayville called Kingson's. Kingston's has a great, unpretentious vibe, attentive, young and attractive service from the hostess on down. Our food, however was a mixed bag. My oysters on the half shell were perfect, my calamari was good. Lynn's broiled seafood was forgettable, however. We had some of the same experience with our libations; Lynn had a dirty martini that was very good, but my standard issue martini was just alright. And, for such a casual place (with plastic forks, for example) our bill was a little on the high side. Thats a great pic, Mark! 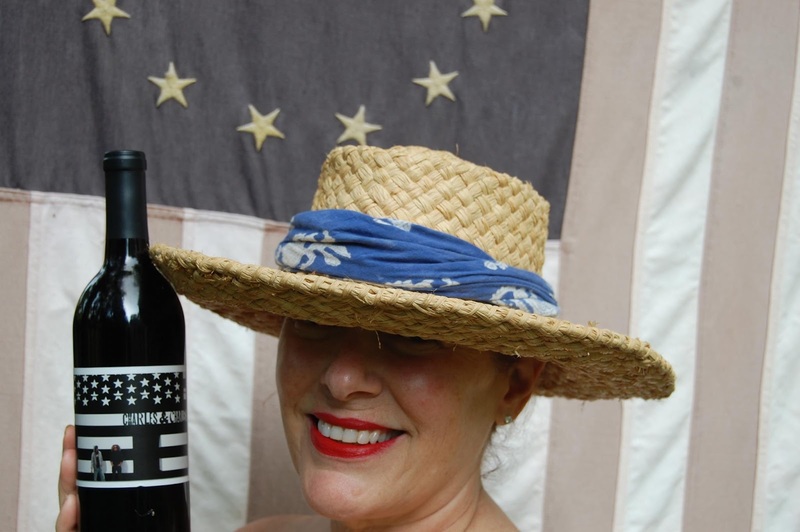 Congrats - you are an official runner-up for our 4th of July Charles & Charles contest. We'd like to buy you 3 bottles of Charles & Charles red at your local wine shop or retailer. Can you let me know your closest/favorite store (with city and/or contact info) and we'll arrange to have you pick up your prize of 3 bottles! Congrats again and hope you had a fantastic 4th of July! our GPS for 22-52 44th Drive and after negotiating some heavy father's day traffic we found ourselves perched on a bar seat in the charming, compact space of LIC Market. The warm, attractive staff made us feel completely comfortable right away. We were particularly charmed by our smashing British waitress Laura who was attentive, engaging and recommended some great French wines from Chemins de Bassac. My ricotta and pignoli salad was brilliant and nicely flavored with oranges and warm roasted chicken, Lynn's mozzarella and radicchio sandwich also had a nice addition of roasted chicken. The food was great and the atmosphere was very cool but what will hurry us back to LIC is the warm and charming Laura who we already miss.